From Gabriella: "Here is the cabbage roll recipe. Please study. You do know that it needs to be served with sour cream on the top and fresh French bread--nothing else, only crepes if you want to do dessert." Place in freezer 1 big or 2 small green cabbages. Leave for several days before thawing. Mix well all ingredients in large bowl and add 2-3 c. warm water and mix. 5-6 lbs sauerkraut, drain juice and mix with 1-2 tsp. caraway seeds and 10 bay leaves. 1-2 lbs smoked ribs or sausage. Carefully peel leaves off of cabbage and put in several T. of the meat mixture. Large pan. Place 1/3 sauerkraut on bottom then 1/2 smoked meat and place cabbage rolls on top. Then 1/3 sauerkraut, then cabbage rolls, the rest of the smoked meat, then the last of the sauerkraut. Add water to cover almost to top. Place in 350 oven and cook 3 hours then lower heat to 250 and cook 3 more hours. Before serving add paprika to top of pan. I'm in the process of of reading 3 books right now. By "in the process" I mean I read one book every day and a little of the others either every day or less frequently. Somehow they all come together. I decided to start my year after vacation. . . I was like an automaton prior to vacation--could not think, could not reason, just going through the motions of life, not participating. After vacation I decided I needed to make some changes. My daily reading is The Message: Remix 2.0. This is a contemporary language reading of the Bible. I first liked this style when I read John and found it true to the feeling of the New International Version, but easy to read and insightful. So this is it for this new year starting in the fall. I am currently reading through and experiencing the freeing of the nation of Israel from slavery in Egypt. Something like the freeing we go through when we turn our lives over to Jesus or when we see a part of our life that is less than desireable and give it to him to take care of. It requires a whole change in the way of seeing and doing. New forms, new activities, new environment. . . I am also sporadically reading the book Free of Charge: Giving and Forgiving in a Culture Stripped of Grace by Miroslav Volf. I am about 2/3 of the way through and the thing that really struck me was the statement I have known since college or before, "I am crucified with Christ, nevertheless I live. Yet not I, but Christ lives in me. . ." When we become followers of Jesus, true followers, in some way it turns out that we have actually been crucified WITH Christ. He was killed in that extremely cruel way and we were too. I don't quite understand this. . . it still has to gel, but Volf explains that we are permeated with sin--its' like ink in water. You can't remove the ink without removing the water. We are the water, sin is the ink. We are not actually removed from the ink, but in some way we were crucified with Christ, so in a way, as Christ fills us, there is less and less sin, or (and this is all my reasoning), the more we are filled with Christ, sin is pushed to a smaller but more concentrated area, so instead of filling us, it's now just popping up in more subtle areas, like, for some of us, pride. But there it is: I was crucified with Christ, nevertheless, I live. Yet, not I, but Christ lives in me. And the life that I now live in the flesh, I live by faith in the Son of God who loved me and gave his life for me. The six-dayes world transposing in an houre. I really liked the beginning of chapter 3. In the opening words of the Apocalypse, "the revelation of Jesus Christ," the preposition "of" carries a double meaning: the revelation is about Jesus Christ; the revelation comes "by means of" Jesus Christ. Jesus Christ is both the content of the revelation and the agent of the revelation. Jesus Christ is the way in which God reveals himself to us; Jesus Christ is also God himself being revealed to us. And I might add, Jesus Christ is also God himself being revealed through us, perhaps as he pushes away the ink. . . a somewhat scary thought! So I recommend all three of these books, but who knows when I will come to the end of any of them! Just a note that I have started using Windows Live Writer to compose and publish my blog posts. So easy! I love posting offline and publishing later. So easy to insert hyperlinks, pictures, maps, and probably videos and tables, too, although I haven't tried that. Also plugins are available for all sorts of things. I also love the spell checking and the very ease of use. I am also very happy that Windows Mail is there to replace Outlook Express for my clients still using Outlook Express. Windows Mail has only 1 downside that I've seen so far--the inability to increase font size for the email list. This is in Outlook, but no way to do it in Outlook Expre--Oops--Windows Mail. Please listen Microsoft. Older clients need larger fonts! I have been keeping up with the posts from an acquaintance of mine who has gone to Tanzania for 5 years. If you want glimpses into daily life for an American in Africa, read. Here is the link and a quote that just struck me as funny this morning- It is daily occurrence to witness men “watering the flowers” on the side of the road…what else is one to do when public restrooms don’t exist? I am doing what I can to pray for her and not just be a hanger on for that trip I probably won't ever take! Here is a map of where she is, has been and will be. Dar Es Salaam is the yellow square with the black center on the right. Ininga, where she is doing her language study, is the little square on the left. It's Been a Long, long time. . . I highly recommend this for anyone stressed or burned out. It is easy to read. No pressure to do anything; no guilt for not doing or not being or not having something. It provokes thought, but not thoughts of lack but of hope. Try it. It's an inexpensive way to get back on the road to hope. OK, Vista boots faster, but too many programs just don't work well with it. Even ones that say they've been upgraded for Vista. . . and the Internet Security program I like best still won't work. I get happy feelings when I boot into XP and I'm having 2nd thoughts about installing Vista on my tablet pc. One of my friends just had a double mastectomy, another long-time Christmas and Easter guest died, others moved a couple of hours away and we haven't seen them since. It's difficult to lose people and difficult for people to lose their body parts, but losing people seems like losing a body part. . . it will never be the same again. And I am ever aware of that. Ihave been experiencing it to some degree since high school and it doesn't get any easier, I just get better at hiding the pain. I've been listening to Red. It's a wonderfully produced CD. I highly recommend it! Windows Vista Mobile Device settings are not allowing sync with Business Contact Manager. Perhaps because it's still in Beta. I'll be checking on a workaround. I installed Windows Vista Business Upgrade yesterday and am doing some final configuring today. I am running an AMD Athlon 64 processor, 1 gig DDR memory, Nvidia Gforce 7100 WDM video card, MSI K8N motherboard. I feel like parts of Vista are still in Beta, but most things are working. The install from start to first icon filled screen took 30 minutes. It actually took longer than that but I learned a couple of things. Unlike XP, you cannot install an upgrade version by booting from the disk. You must install it from inside Windows. And because I tried to install from my current Windows XP Pro with very little space (only 2 Gigs) left on the hard drive, it was unable to install. I could not tell it to put its install files on my huge empty Drive D.
Nor can you just tell it to look for a Windows CD to install. I had to install Windows to my D Drive and then install Vista. So 40 minutes for the Windows XP and 30 minutes for the Vista. This is a bad solution from Microsoft. Many times I have fixed a Windows 98 install where the computer would not boot into 98 by buying a WinXP upgrade and installing it using the old Win98 disk or with the the upgrade disk seeing the Windows folder on the hard drive. BAD, BAD, MICROSOFT! Another observation: Even with 1 gig of memory, I am still using 75 to 90 percent of it just by running Outlook 2007 and normal startup programs. Memory usage seems to get worse the longer the computer is on. So I'm recommending 1.5 to 2 gigs of memory to start. Ease of install: barring the initial problems, install was practically perfect. It installed all hardware automatically except for printers and scanners. It took a couple of boots for everything to work but it did work. My Dell Axim synced easily with me doing almost nothing. I do not like this Beta synchronization program, however. It doesn't let me know whether it's syncing my business contacts or just what is syncing. And I had no choices. I ended up with duplicate calendar entries for years. I had to buy a program to remove the dupes. As for Business Contact Manager syncing I'll just have to create a new contact and see. Neither of my printers installed easily. I am using a USB connected Konica Minolta 2300W color laser connected by USB and a Xerox Docuprint P8. I finally got the Konica Minolta to install but the Xerox will not. I use it for everyday printing because black is cheaper. Looks like its new printer time. I can't fault Microsoft for this. This Xerox printer was a little difficult to install in Windows XP; the drivers were written for Windows 2000. And Xerox had problems with this printer. Nor did Vista detect my scanner, an Epson Perfection 1650. I haven't tried installing it yet manually yet. Oops, it did detect it but didn't know what to do with it. It's in Device Manager with an exclamation point. Another quibble, I have an APC battery backup and Vista thought I was running on battery. I was able to change that, but it's odd. Software: MS Office 2007 installed perfectly, of course. TurboTax installed perectly but could't find the returns I'd been working on. I'll deal with that later. Adobe Acrobat 8 and Flash Player installed perfectly. Freeware that I use installed well: Password Safe (to store passwords) and AVG Antivirus. I cannot use my preferred Zone Labs Internet Security because it's not available for Vista yet. I'll post more as I try other things. Last night, at the Palace Theatre, I saw Paul: A Musical Journey. It was much better than I expected. True to history in it's general plot, with a musical story line that kept me interested. There was humor and some pathos. You can read more about this musical here . Musically, It was a very good mix of the various types of instrumental music: light jazz, gospel, and R&B. The musicians were strong, and there was good interplay between the instruments and the excellent vocals. The plot moved fluidly from one scene to another with the help of an able narrator. There were a few technical glitches: men's voices tended to overdrive the mics, a couple of lighting problems, and one scene I would have cut because it added nothing (the scene with John Mark and his mother encourging him.) Some of the dramatic effects unintentionally created laughter which was fine because there was light humor throughout. 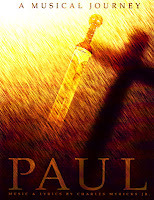 For a humorous look at the Apostle Paul with excellent music and vocals, give this a try. I don't know what it takes to schedule something like this, but but just a quarter page ad in the late fall is not sufficient for something performed in late January. There was a little mention the Thursday prior but nothing on radio stations, TV, billboards, or any place else in the newspaper. So many people missed a worthy performance. If it comes back I will encourage friends to see it. I don't often read fiction, but I read a lot of it last year. Below you will find my short list of recommendations. Click on any title to see it at Amazon. Sutter's Cross by W. Dale Cramer--Absolutely the best fiction I read last year. Well written, excellent character development. If you only read 1 novel, read this one. Outriders and Trackers by Kathryn Mackel--a series for fantasy lovers--I'm not one, especially, but these books are well-written and drew me in to the plot, the characters, and the situations. I hope never to be in that world, but it gave a glimpse of good reclaiming what was lost. Shoofly Pie and Chop Shop by Tim Downs--light-hearted forensic mysteries. Just what I needed! Germ and Comes a Horsman by Robert Liparulo--Thrillers. I'm not sure which one I liked best. Germ started abruptly and perhaps would make a better screenplay than a novel. Comes a Horseman had better character development. But I liked both. OK, I'm able to log onto my Xanga blog and see it and make changes, but I cannot load it from Firefox or IE. I can load Xanga's web page, but when I try to see my blog page it loads nothing. So, if Xanga's not dead, it's dead to me, and I paid for premium and this is free! Not as many perks and other things, but I can access it from anywhere and so can you. For this blog, my older blogs are listed on the right. Most were done today, so check them out. Ok, I'm back. Reading a couple of books that really make me think. .. doesn't hurt to have a house guest that does the same. Our own conception of God may be an idol. Are we trusting Him to give us the desires of our heart? Do we even know what those desires are? He says in Isaiah, My thoughts are not your thoughts and My ways are not your ways. And yet we decide that we know what we want/need and ask Him for it expecting even more wondrous things than we ask and even better than we expect. But what if His way is painful and His thought completely different from yours? Do we even know what the desires of our own hearts? Are we creating an idol-god who gives what we think we should get from the desires we think we understand from our hearts? Or, like Salieri and Mozart, are trying to promise God something in exchange for what we think we deserve, and then feel slighted (at the very least) when someone else gets what we thought we should have gotten or if we never get what we think we deserve. I know everyone has these thoughts. Do you hold what you have lightly waiting for God's next move or are you clutching what you have afraid that you will lose it? Something to think about. The author of the book I'm reading (and his wife) had the deep desire for children, but infertility kept him and his wife from having any. They tried for years without success and with they pain only other infertile couples why desire children can understand. Then one day they adopted a child, and 4 years later, they were able to adopt another, not the original desires of their hearts as they knew those desires, but a secondary option. Today those two adopted children are the hearts' love and the hearts' desire realized. The author noted that these two particular children would never have been part of their lives, had they not had to suffer through infertility. OK, First, if we put on Christ, if we live as he would live, were he living life as us, we wouldn't be captivated by hollow and deceptive philosophy. But, if we aren't vigilant it's easy to be deceived. I'm not talking about hyper-vigilance where we examine everything. . . we wouldn't have time to live! But I have been reading a book about design and truthful communication, Beautiful Evidence by Edward Tufte . Tufte explains beautifully (no pun, it is a beautiful book) that much of what we see presented in reports, pictures, newspapers, textbooks is designed to obscure truth, at the best, and at the worst, misrepresent. So read this book. If you are not a statistician or scientist, you might want to skip to then end of some of the sections and read the conclusion. Reading the end of every paragraph will give you a clue. But non-statiscian, non-scientist me is reading every word and thinking. Because as Tufte said, quoting someone else, it is better to be ambiguous than to lie. But read the book for yourself and see how "truth" presented in a common visual manner leads to lies that kill. And I put it up so quickly that I haven't yet spaced it properly. Do not click on the ad below it, just the words. They say blogging is dying. . . I read it in the newspaper . . . so it must be true! But I communicate better in writing than in speech. By the time I have edited and spoken my speech, the topic has usually changed! So blobbing along, blogging a song, blogging a thought will continue for me! I was with someone who kept getting phone calls. Her husband said that it must be one of her many friends. I don't have "many" friends. Perhaps because I'm an introvert. But, I'm frequently looking for ways to do friendship better. [W]e picture lovers face to face, but Friends side by side; their eyes look ahead. That is why those pathetic people who simply "want friends" can never make any. The very condition of having Friends is that we should want something else besides Friends. Where the truthful answer to the question Do you see the same truth? would be "I see nothing and I don't care about the truth; I only want a Friend," no Friendship can arise--though Affection of course may. There would be nothing for the Friendship to be about; and Friendship must be about something, even if it were only an enthusiasm for dominoes or white mice. C.S. Lewis The Four Loves (New York: Harcourt, Brace Jovanovich, 1960), 98. Perhaps I'm one of those "pathetic people," just wanting friends to have friends, so my phone can ring off the hook. And at least there is some part of me that does want this. The other part of me would be annoyed if the phone rang so often! I really just want a few friends with a friendship about something but not dominoes or white mice or hiking, or music, or books. I want friends that look to the spiritual. . . how to do life, what matters, where do we go and how do we get there. . . . I want to share real life, not the stuff we fill it with until life ends. I want to know the other person so well that I can better love him/her. And I want the other person to know me as well. And yes, we will focus on something and someone beyond us. This new blog is just getting started, so things might not look very good! I have just moved to Blogger so here are my old Blogs. Well, I meant to blog on a weekly or monthly basis, but time has gotten away from me. . . we've experienced cat deaths, setting up a guardianship for my dad, getting him into a nursing home, and then having him suddenly die about a month later. I don't usually advise people to find an attorney simply by doing a web search, but that's what I did. I searched google using my zip code , found an elderlaw firm nearby, called and made an appointment. . . only to find out that the attorney leads a small group at my church. Don't do what I did ,but in my time of great need , God's provision was evident. Now we've just buried another cat and we're in the process of fall fix-up (remodeling the bathroom), and fall clean up. . . and of course eagerly anticipating the OSU-Michigan game. I'll be more insightful soon. . . along with a list of the books that helped me through this time. It's a lot of eye-candy. It will make it extremely easy to find anything on your computer. It will search like Google. All versions (6?) will be on the same DVD with the unlock key determining which version you have. Tighter security which makes me happy. Will be released for the Christmas holidays (I think). Microsoft says a minimum of 512 MB of memory. They said 128 for Windows XP and we all knew 512 was best. Does that mean that we'll actually need 1.5 GB? Only time and experimentation will tell. Will it work with existing hardware? I don't know? Will it work with existing software? I don't know. It will all depend on the manufacturer of the hardware and software. Can it boot from a SATA drive? Not without additional drivers. Will it change between now and its final release? Most assuredly. And just a brief reminder. You should always backup your data before you make changes. I have been working on my webpage, did not backup and it somehow reverted to last June! Oh, well. . .
Spring is popping up. . . at least the first harbingers. I always thrill to see the iris reticulata start to bloom. I love blue and they are the truest blue of any flower in the garden. I am reading about Joshua's conquests of Palestine? Anyway, it fits right in with the book I just finished because, people of Israel, like me, and probably like people everywhere, just want to sit around and get into a comfortable lifesyle--a settled downness. The book I just finished reading, Eternity in their Hearts, shows how indiginous people groups have a story, a practice, an item, which prepares them precisely to hear about the one true God when He is presented to them. It really is just filling in lost memories, lost knowledge. I know I don't observe closely enough or listen deeply enough to see a personal story, practice, or item in the lives of the people I meet. And the end of the book challenged me, too, as it points out that Jesus' own Apostles, just stayed in their comfort zone, not venturing out until they were forced. I too often just enjoy sitting and reading a book and privately assenting or disagreeing with its premises. That's easy and comfortable. However, a couple of friends have challenged me to do more. To tell them about the book. To tell them my impressions. A this book has challenged me to leave my comfort zone in a couple of ways. . . but that's just the way God is . . .always pushing me upward and onward. . .
More about the book later. Ever have one of those weeks? Where Orange barrels are everywhere? Where you are bone-tired by Wednesday, just plodding through the rest of the minutes, hours, days, hoping for a Saturday sleep-in? And part of that is the rushing. . .pushing. . . from one thing to another, one place to another. Always hampered by those pesky orange barrels. I have never had siblings. Neither has my husband. I have to look to my friends to think about what it means to have a brother. I always wanted one. There's usually a family resemblance, shared experiences, shared values, shared histories, but perhaps those of you with siblings could go on better than I can. What does it mean to be Jesus' brother or sister, in my case? A lot to think about. This has been a hard time. My friend's mother died. Another friend's mother died. Our best cat of all time died. And I have been reading in the Bible about sacrifices in my daily readings. The cat, Elroy, who we called El boy, was the last straw. He had spent every day of his life with us. He was the one cat who was always where we were, who had moods like we did, who had unusual interests like we did. The cat most like a person. I just had to add the picture of him sleeping with his mother, Annie, here. Christians live life ineffectively because we've forgotten our goal: Heaven. Reading Paul's letters, he focuses on the hope of heaven: i.e. being with Jesus. The author of The Slumber started thinking about these issues when his brother died and was writing the book when his doctor discovered a lump in his pancreas. The idea is that life is supposed to be hard, disappointing, non-fulfilling, full of "smashed rainbows," because this is not what we were made for and not our hope. As Paul said, I would rather die and be with Christ, but it is better for me now to be with you. We are made to feel deeply unsatisfied by not being with Christ. I have felt that way for a very long time and am pleased to find that it is normal! Life is also pleasurable, for our enjoyment. The pleasures are a foretaste, to be deeply enjoyed with the knowledge that they will be even better when we are with Christ Pleasures cannot satisfy because we were not meant to be satisfied here. They should leave us longing for what will satisfy us and that's not here on this earth. Oh, but I wish it could be here and now! I just finished seeing The Chronicles of Narnia movie. I needed to see it after losing Elboy. I had read the books decades ago and knew the plot, but I just needed to see it to regain hope. And that's what happened. God will renew the earth and us and animals and everything that Satan has taken. I can't wait! I hope you dance . .
You get the idea. Choose to live in the presence of death.